Every time I see my little nephew, Ry-Guy, I fall in love with him more and more. He is over 5 months old now, I can't believe it. 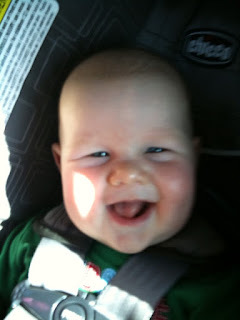 Now he is mr. smiley pants, giggly pants, he rolls over, bounces, eats rice cereal and flirts! Big smiles for Auntie Tracy! Sweetest baby face ever. Look how happy he is!!! It made me smile too!!! that first picture is gosh darn ADORABLE! no wonder you're such a proud auntie. and obviously he loves just as much as you love him. so so cute! I love his chubby cheeks!! He looks soooo happy- babies always cheer me right up! he is just so ADORABLE!!! :) perfect baby cheeks! 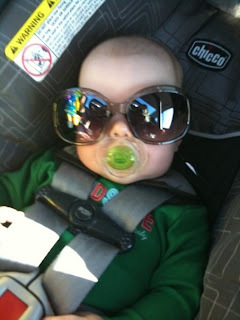 awww, Love him wearing your sunglasses. So cute! What a cutie! I am in love with his precious chubby cheeks!!! aw, what an adorable little guy!! being an auntie is the best!! my little bubba loves his auntie too! Oh my he is just adorable!